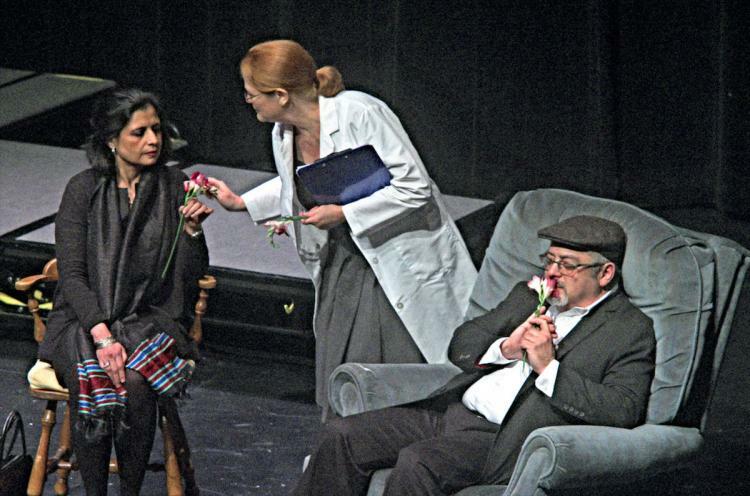 In a recent production of Infinity Box Theater, the science writer of the UW Memory and Brain Wellness Center helped to create a short play about dementia. It was a whirlwind of creative challenges, including inspiring a playwright, coaching an actor on performing dementia, and a science talk on memory and Alzheimer disease. “When I woke up on Monday morning, I had no idea I was going to write a play about dementia,” says Pamela Hobart Carter, a playwright in the Seattle area. 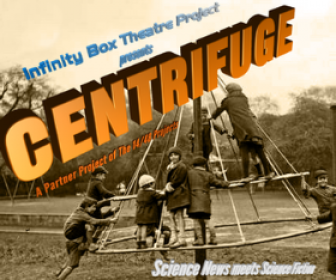 Indeed, Centrifuge, an experiment in science and theater by Seattle’s Infinity Box Theatre, led by artistic director David Mills, recently presented a surprising challenge to five science writers and five playwrights. On Monday, we were randomly assigned into pairs with the task of creating a 10-minute play based on the science writer's particular interest, by Wednesday. 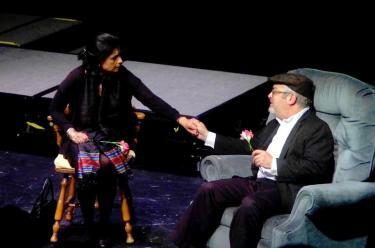 Carter, my playwright partner, embraced the idea of focusing on my writing specialty in Alzheimer disease and neurology. As the teams around us talked about climate change, genetic engineering, frog biology, and asteroids, we dove into a long, late-night discussion about the neuroscience of memory and the impact of dementia on family life. 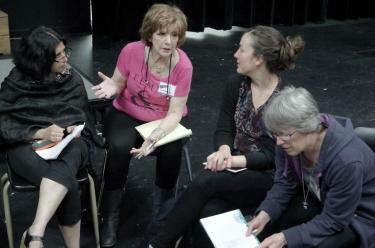 During our freewheeling brainstorming, we shared our personal family experiences with dementia. I told her about clinical research at the UW aimed at developing evidence-based strategies to live more easily with memory decline. Carter listened with particular fascination to my description of my favorite dementia-friendly community activity in Seattle: Garden Discovery Walks, a free, social opportunity for people living with memory loss in the floral bounty of Seattle's community gardens, made possible by Seattle Parks and Recreation, Seattle Tilth, and the UW Memory and Brain Wellness Center. 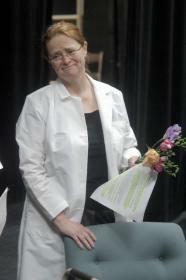 Actress Geni Hawkins plays Courtney, a neurologist who uses flowers in her approach to dementia care. I watched Carter scribble down notes, realizing she was sketching out the beginnings of our science play. It’s true that time constraints can encourage creative productivity. By the next afternoon, Carter had the draft of a play, titled A Few Things Remain. Set in a room of a dementia care facility, the play explores the family relationships between Amos, a retired geologist living with mid-stage Alzheimer disease, his sister Rosa, and his grand-daughter Lena who initially reacts with skepticism as a neurologist, Courtney, hands out flowers. Yet, as the potent fragrance of freesias triggers long held memories for everyone, the women come to see the value of recognizing Amos' intact social abilities and personality. Carter seamlessly incorporated the science of human memory through the character of the neurologist, who spent a lot of time explaining to Lena and Rosa that Amos has trouble making new short-term memories, but he retains some aspects of his procedural and long-term memory. On Wednesday night, the five Centrifuge teams gathered again for another random assignment. We drew director Lenore Bensinger and actors Geni Hawkins (Courtney), Jess Askew (Lena), Meenakshi Rishi (Rosa), and Steven Sterne (Amos). With the performances on Friday and Saturday nights approaching quickly, we grabbed every possible moment and any open space in North Seattle College to rehearse and run lines. One unexpected learning opportunity for me came when Sterne, an instructor at the Seattle Public Theatre, requested my advice about acting like a person experiencing dementia. I realized what a challenging acting job the script asked of him: he must inhabit the reality of a person unable to follow complex conversations, but still be able to appreciate social cues and recall distant memories. There were minor details: slow, hampered speech, a mild tremor in arms and hands, a distant gaze. And there was the substantial task of challenging the perception that dementia eclipses all cognitive ability, in order to reinforce the idea that people with memory loss have active inner lives and wisdom to share. On opening night, Sterne stole the show. The audience laughed at his unintentionally comedic moments and gasped as Amos learned, for the second time, about the death of a family member and was able to join his sister in grief. “Centrifuge was an exhilarating test of flexibility, grace in accepting what comes your way, openness to the inspiration that comes from all sides, and acting chops,” Sterne said. “This is my favorite way to make theater right now.” If we re-run this show in the future, Sterne later told me, he wants first dibs on the role of Amos. The real job of the science writers in Centrifuge is to introduce the science play to the audience. For me, it was the ultimate science writing challenge. I needed to make sure to consider exactly what the audience needed to hear to appreciate the memory science in the play and to continue to think about the issue of wellbeing in the context of dementia long afterwards. Soon enough, I was standing in a bright pool of light, talking into the theatre's electrified darkness about the clinical research happening in the HABIT Study at the University of Washington, Mayo Clinic, and University of Florida to help people with mild cognitive impairment compensate for losses in short-term memory by relying more on intact aspects of procedural memory through habit formation. “Now that's how I want to learn about science,” said Marigrace Becker, my colleague at the UW MBWC, after the performance, echoing the feeling of many others. Coming Up: The next Infinity Box event is its annual Thought Experiments on the Question of Being Human, which will take on the topics of memory and identity—and so it goes without saying that the UW Memory and Brain Wellness Center will participate. They've already paired up four scientists and four playwrights. The plays, 20 to 30 minutes long, will explore the human consequences of the current direction in a scientific field, and what might that mean for the question of what it means to be human. Staged readings of the plays will be held October 14, 15, and 16 at the Ethnic Cultural Theatre in the University District in Seattle. After the readings the scientists will kick off audience discussions about the shows. Podcast interview with Infinity Box's David Mills and Catherine Kettrick about their efforts to create science fluency through theater, hosted by Seattle Astronomy.